The first speaker to address the group was ”Ali”, a refugee from Afghanistan who related his experiences since his arrival. On the first night they attended a “Bush Dance”. Caitlin is staying in touch with others in her group. The first breakfast was an early start with “Rebecca” as a speaker who told them they were all birds and split them into groups. Caitlin was a “dove” and this was a great “team building exercise”. There was a United Nations event that assisted them in meeting more and more people in the Camp. Another speaker was Shane Felix of the Australian Army who spoke on “serve & sacrifice”, “know your team and what makes them tick”. Another speaker was Guy Cooper, Head of Community Development, with the Wayside Chapel at Kings Cross, who spoke on teamwork. The group also got involved in a community service project doing some landscape work at a local school. 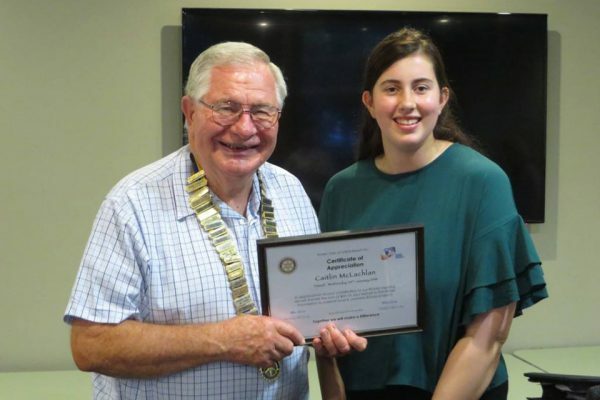 Caitlin spoke on how great the Rotary Dinner was and then spoke about another speaker, Rick who discussed emotional intelligence and showed the participants how to put themselves in the “right position” before trying to get others to follow. His message was “Keep it simple, but NOT simplistic”. It was good to see that Caitlin brought so much back from that part of the RYLA experience her health allowed her to attend.